Flaxseed assists in preventing constipation when taken daily and used in combination with eight glasses of water daily. 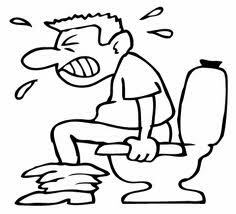 This will help in alleviating chronic constipation. The water will keep bulk moving along within the digestive system. Swallow a table spoon of olive oil for constipation. Chinese rhubarb is the main ingredients in an Asian prescription for constipation. Pure three Chinese rhubarb stalks (not to be confused with garden rhybarb), add 250 mL (1 cup) apple juice, 1 L (4 cups) of water, 1/4 peeled lemon and 15 mL (1 tbsp) honey. Bring to boil and simmer for 20 minutes. According to Dr. Joseph Yuk-Shing Wong, a Toronto physician specializing in physical medicine and rehabilitation, the ingredients are natural laxatives that also boost the digestive system. Don't forget to take in a glass of hot milk with a teaspoon of clarified butter at bedtime. Or Drink a glass of boiled water with one teaspoon of flax seed.